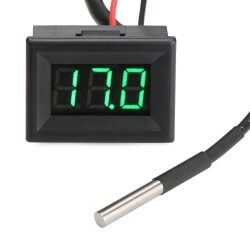 It is a Car Charger Voltmeter Thermometer with 5V 2A Chargers Usb,Input voltage: 12V/24V,Suitable mo.. It is Car Charger Voltmeter Thermometer,Power mode: cigarette lighter power,USB Output, built-in fus.. It is a Sensor/Temperature Sensor, Type : DS18B20 high temp sensor,silicone shielded Cable, Measurem..